Do you need to add Keywords and Meta Descriptions on your WordPress Site? Your website SEO might be improved using proper Keywords and Meta Descriptions on the site. This article helps you to add Keywords and Meta Description to improve your site SEO. What does it Mean and Why they Matters? Keywords and Meta Description which is used to tell the search engine about the content of your post. Meta Keywords are actually, HTML meta tags that are used to search for some content over the internet. Meta Description is a brief review of the page or post content. You need to specify Meta Description and Keywords of the site to make your search engine visibility. It allows search engines to know more about the content of your posts and pages. There are many Search Engine Optimization (SEO) techniques to boost your website visibility. For all posts and pages, WordPress SEO plugins made it possible to add them from your WordPress admin area. While adding Meta Description to your site, it is necessary to understand that how to create a useful description that gives results. 1. Meta Description Characters should be up to 155. 2. It should be in active voice. 3. Add relevant words to the Content. 4. Focus keyword should contain in the Description. 5. Meta Description should be unique. How are these Important for SEO? The search engine never shares how much weight they assign to keyword and description. However, It’s important and helps us to rank better. Some SEO experts believe that keywords are not necessary for ranking. Google also says that they don’t give importance to keyword but, some SEO experts don’t agree and advises users to add keywords in your post and pages. Google automatically pick out a few sentences from your site you don’t need to create by itself. The Meta Description helps to form the first impression of your site on potential users. Therefore, it plays an essential role in whether they choose your content to view or not. So, Meta description plays an essential role to grab the user’s attention. There is no direct ranking benefit from the meta description because Search Engines do not use it in their ranking algorithm. However, it benefits indirectly as the Google uses click-through-rate (CTR) as a way of working out whether or not you are a good result. Yoast SEO plugin is the best plugin to add Keywords and Meta description in WordPress. This Plugin has built-in support for the Meta Description and Meta Keywords. Yoast SEO plugin offers a set of useful feature. It enables you to create a focus Keyword, set up a Meta Description and improve your content’s readability. 2. Go to the plugin section of WordPress and click on the Add New button. 3. Search the plugin, Yoast SEO. 4. Install the plugin and click on Activate button. 5, After activating the Yoast SEO plugin, you have to proceed to add Meta Description and Keyword. 1. Go to Posts menu >> All Posts. 2. Click on Edit link to add the Meta Description. 3. When the post opens in the Text Editor, you need to scroll down to the Yoast SEOsection. 4. Under the SEO title field, there are two additional fields Title Slug and Meta Description. 5. Click on the Edit Snippet button and Enter your catchy description of your post. 6. When finished, click on Close Snippet Editor and press Update button to save changes. Note: In your Meta Description, you should use your main keyword at least once. 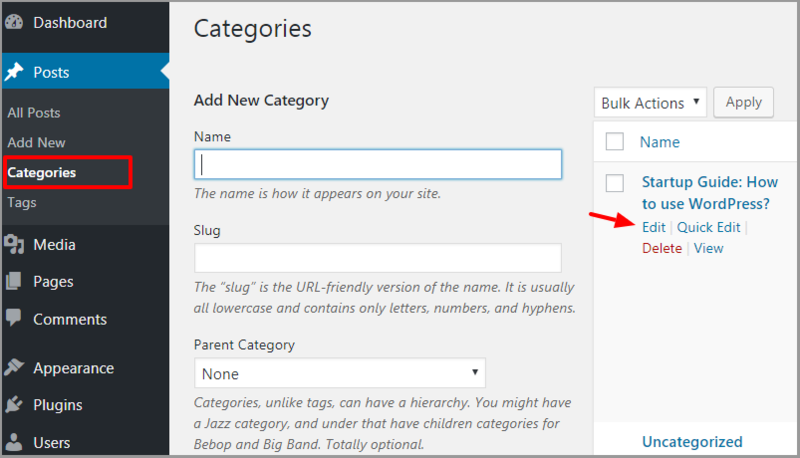 Below the Site Title and Description field, you will find the Meta Keyword field. Add multiple Keyword separated by commas. Uphold good SEO practices here as well, only use those keywords that are relevant to your content and present in the article itself. Note: Don’t use more than 10 Keywords in your post. 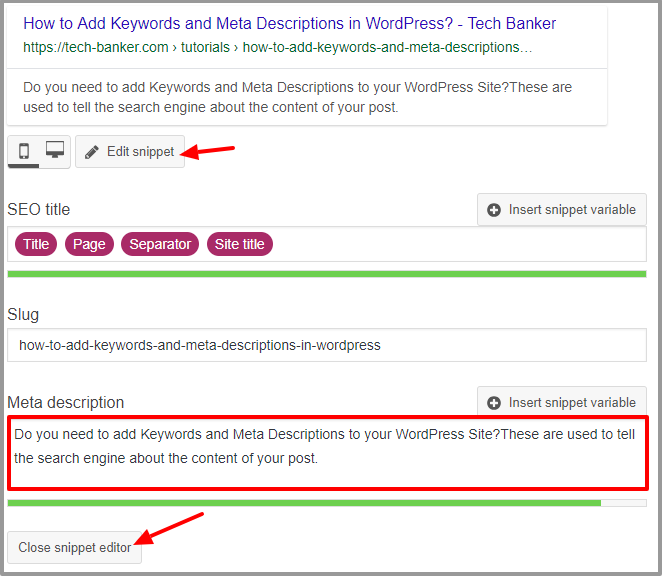 Now click on Publish after adding Keyword and Meta Description to your post and page successfully. 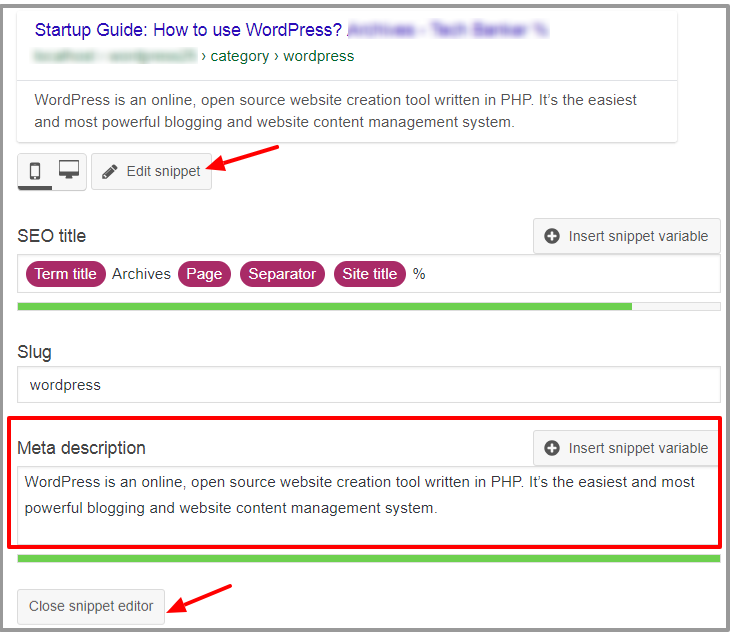 Using simple step, you can add Meta Keyword and Meta Description to your WordPress posts/pages. Using Yoast SEO plugin, You can also add Meta Description to the homepage of your site in WordPress. 1. Click on Search Appearance under the SEO Menu in your dashboard. 2. Under the General section, there is another field labeled Meta Description. 3. You have to Add, the Home Page Meta description in the snippet. 4. Click on Save Changes. The Content Types tab allows you to create a Meta Description in all your posts and pages. It helps you to set a specific unique content as a description and proves to be very useful. 1. Press Categories under the Posts menu. 2. Now choose the category which you want to add Meta Keyword and Description. On the right side of the page, Yoast SEO Meta box settings appear. 3. Click on Edit link that opens the Category Editor page. 4. 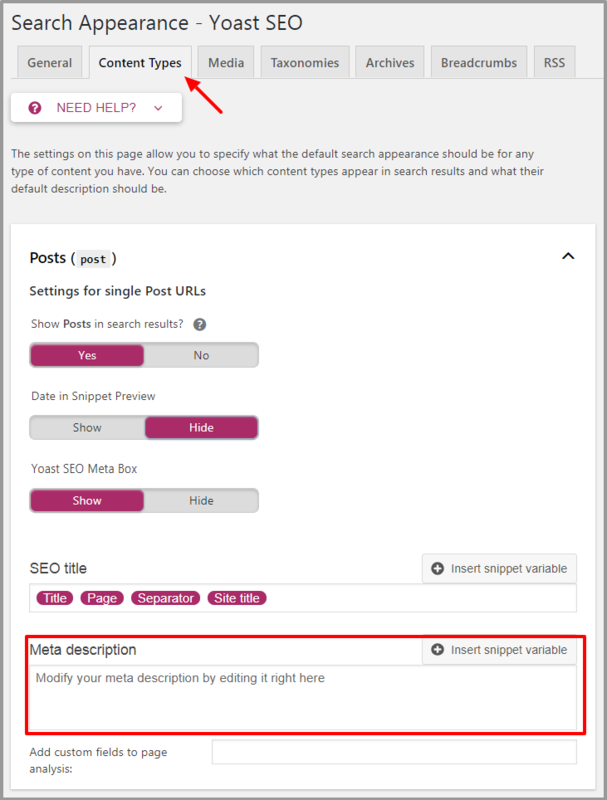 Scroll down to the Yoast SEO section, Click on the Edit Snippet button and enter the Description of the category. 5. Click on Close Snippet Editor. 6. Scroll down to Add Keyword in the category, Choose those keywords that are relevant. 7. Click on the Update button to store settings. I hope this article helps you to learn how to add Meta Keyword and Meta Description to your pages and posts.